South Africa 6-170 (Jean-Paul Duminy 86*, Hashim Amla 41, Corey Anderson 2-28) beat New Zealand 8-168 (Ross Taylor 62, Kane Williamson 51, Dale Steyn 4-17, Imran Tahir 2-27) by two runs. A deadly bowling spell from the speedster, Dale Steyn, crippled the batting line up of the Kiwis while Jean-Paul Duminy batted excellently to win the game. The Proteas amassed 170 runs for the loss of six wickets in 20 overs and the Kiwis were restricted to 168 with two wickets in hand. Dale Steyn (South Africa) was announced ‘Player of the match’ for his lethal bowling spell of 4-17. The ICC World T20 – 18th Match, Group 1, was played on Monday, March 24, 2014, at Zahur Ahmed Chowdhury Stadium, Chittagong. Earlier, Brendon McCullum, the skipper of the Black Caps, won the toss and invited the Proteas to bat. 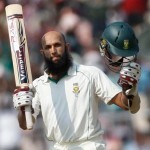 Hashim Amla witnessed the departure of three top order batsmen for just 42 runs in 6.4 overs when Jean-Paul Duminy associated with him at the crease. They started the repair work and took the score to 97 when Amla was caught and bowled by Corey Anderson for 41. The game was taken over by Duminy who was punishing the bowlers at will and completed his 7th T20 fifty on the 31st ball with a four. He continued with his blast and remained unbeaten for 86 off 43 with 3 big sixes and 10 fours. Tim Southee and Corey Anderson were the main wicket takers with two each whereas Kyle Mills and Nathan McCullum held one each. Martin Guptill along with Kane Williamson took off smartly for the Black Caps by scoring 57 runs in 7.1 overs. The first was gone at that point for 22 and Brendon McCullum departed for just four runs. Ross Taylor walked in next and dispatched three consecutive sixes in the 12th one while Williamson went past his maiden T20 half century in the process. The latter went back to the pavilion at 117 for 51 and that was the beginning of the disaster for the Kiwis. Ross Taylor smashed his fifth T20 fifty on the 26th ball and his team was very much in the game but the wickets were sliding at regular intervals. They required just seven runs to win from the last six deliveries but Dale Steyn got two wickets in five wickets with four runs. Ross Taylor was run out on the final ball for 62 off 37 comprising 3 lofty sixes and 4 fours and New Zealand managed 8-168. Dale Steyn was the star performer with four wickets, Imran Tahir got two whereas Albie Morkel chipped in with one wicket. 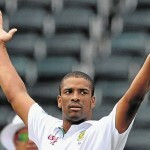 South Africa triumphed in a cliff- hanger with a narrow margin of two runs and opened their account with two points.